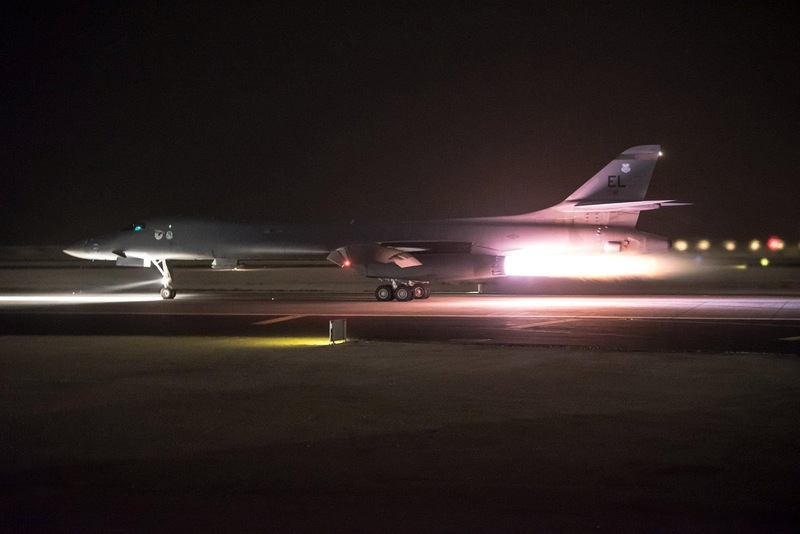 A U.S. Air Force B-1B Lancer, deployed to Al Udeid Air Base, launches a strike as part of the multinational response to Syria's use of chemical weapons is seen in this image from Al Udeid Air Base, Doha, Qatar, April 14, 2018. Western powers said Saturday their missile attacks struck at the heart of Syria's chemical weapons program, but the restrained assault appeared unlikely to halt Syrian President Bashar al-Assad's progress in the 7-year-old civil war. The United States, France and Britain launched 105 missiles overnight in retaliation for a suspected poison gas attack in Syria a week ago, targeting what the Pentagon said were three chemical weapons facilities, including a research and development center in Damascus' Barzeh district and two installations near Homs. The bombing was the biggest intervention by Western countries against Assad and his superpower ally Russia, but the three countries said the strikes were limited to Syria's chemical weapons capabilities and not aimed at toppling Assad or intervening in the civil war. President Donald Trump called the operation a success. He proclaimed on Twitter: "Mission accomplished," echoing former President George W. Bush, whose use of the same phrase in 2003 to describe the U.S. invasion of Iraq was widely ridiculed as violence there dragged on for years. "We believe that by hitting Barzeh in particular we've attacked the heart of the Syrian chemicals weapon program," U.S. Lieutenant General Kenneth McKenzie said at the Pentagon. However, McKenzie acknowledged elements of the program remain and he could not guarantee that Syria would be unable to conduct a chemical attack in the future. The U.S. ambassador to the United Nations, Nikki Haley, said at an emergency meeting of the U.N. Security Council that Trump told her that if Syria uses poisonous gas again, "The United States is locked and loaded." The Western countries said the strikes were aimed at preventing more Syrian chemical weapons attacks after a suspected poison gas attack in Douma on April 7 killed up to 75 people. They blame Assad's government for the attack. In Washington, a senior administration official said on Saturday that "while the available information is much greater on the chlorine use, we do have significant information that also points to sarin use" in the attack. Ten hours after the missiles hit, smoke was still rising from the remains of five destroyed buildings of the Syrian Scientific Research Center in Barzeh, where a Syrian employee said medical components were developed. Syria released video of the wreckage of a bombed-out research lab, but also of Assad arriving at work as usual, with the caption "Morning of resilience". Late on Saturday Syria time, a large explosion was heard in a Syrian government-controlled area in a rural region south of Aleppo, according to the Britain-based war monitor The Syrian Observatory for Human Rights. The Observatory said the cause of the explosion was unknown, as well as its target. The United States, Britain and France have all participated in the Syrian conflict for years, arming rebels, bombing Islamic State fighters and deploying troops on the ground to fight that group. But they have refrained from targeting Assad's government, apart from a volley of U.S. missiles last year. Russian Foreign Minister Sergei Lavrov said the strikes were "unacceptable and lawless." Syrian state media called them a "flagrant violation of international law," while Iranian Supreme Leader Ayatollah Ali Khamenei called it a crime and the Western leaders criminals. Russia had promised to respond to any attack on its ally, but the Pentagon said no Russian air defense systems were used. Syria fired 40 unguided surface-to-air missiles - but only after the Western strikes had ended, the Pentagon said. "We are confident that all of our missiles reached their targets," McKenzie said. British Prime Minister Theresa May described the strike as "limited and targeted," with no intention of toppling Assad or intervening more widely in the war. Washington described the strike targets as a center near Damascus for the research, development, production and testing of chemical and biological weapons; a chemical weapons storage site near the city of Homs; and another site near Homs that stored chemical weapons equipment and housed a command post. The Pentagon said there had been chemical weapons agents at one of the targets, and that the strikes had significantly crippled Syria's ability to produce such weapons. Trump spoke to May and French President Emmanuel Macron to discuss results of the strikes, the leaders' offices said. Dmitry Belik, a Russian member of parliament who was in Damascus and witnessed the strikes, told Reuters: "The attack was more of a psychological nature rather than practical. Luckily there are no substantial losses or damages." In Douma, site of the suspected gas attack, the last buses were due on Saturday to transport out rebels and their families who agreed to surrender the town, state TV reported. That effectively ends all resistance in the suburbs of Damascus known as eastern Ghouta, marking one of the biggest victories for Assad's government of the war. The Western assault involved more missiles than a U.S. attack last year but struck targets limited to Syria's chemical weapons facilities. The U.S. intervention last year had effectively no impact on the war. Syria agreed in 2013 to give up its chemical weapons after a nerve gas attack killed hundreds of people in Douma. Damascus is still permitted to have chlorine for civilian use, although its use as a weapon is banned. Allegations of Assad's chlorine use have been frequent during the war although, unlike nerve agents, chlorine did not produce mass casualties as seen last week.